Sometimes I don’t even see the bride’s shoes until I’m looking at the wedding photos months later. Don’t get me wrong, I love wedding shoes. I think this is a great place to see the personality of the person wearing the shoes. But I often miss this detail in the flurry of the wedding day details, and the tasks that I have to focus on. I was pleasantly surprised to see all of the blue wedding shoes this year. About half of my clients made their wedding shoes their something blue. If you need more shoe inspo, you can check out the wedding shoes of 2016 and the wedding shoes of 2015 from all my clients. Blue glitter Jimmy Choos at the Hotel Monaco in DC. Strappy silver flats for a Virginia home wedding. Photo by Heather Ryan. Classic blue wedding shoes for a Riverside on the Potomac wedding. Photo by AE Landes. Elegant white Badgley Mischkas for a wedding at DAR. Photo by Kurstin Roe. Glam blue Manolos for a Virginia private estate wedding. Photo by Lisa Boggs. 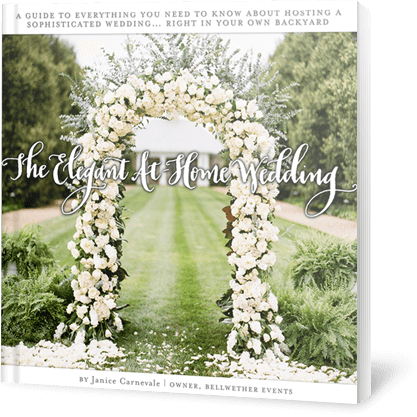 Receve your copy of my eBook "The Elegant At-Home Wedding", free for joining our email list. © Copyright 2017, Bellwetherevents. All rights reserved.